I am so excited that I to announce, yes I said ANNOUNCE, that I will be attending my first blogger conference! BlogHer is a wonderful conference that occurs annually for women bloggers. This is my first time really investing in my “TotallyTot” brand. I am very nervous and excited at the same time. I’m horrible at “small talk” and don’t want my encounters to seem forced, oh and let’s not mention wardrobe!!!!! But, outside of the nerves and excitement I am thankful to God for this amazing opportunity. When all of my friends were going to college, I jumped right into the corporate world and completely skipped the real college experience. I feel like blogging and building my little brand is a chance to have a similar experience. The blogging world is truly like the largest college campus EVER! You can either stay in your shell and blog your heart away or you can join every group on campus and enjoy the social side of blogging and learning. Although I have been to NYC tons of times, (even had my Bachelorette party there) this time is different. 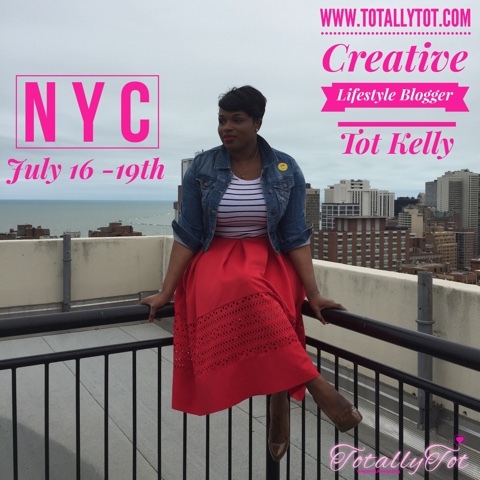 This time I will arrive as Tot Kelly, the Creative Lifestyle Blogger from Chicago! This conference is like the ideal first conference if you ask me. The resources that they have provided are super helpful. There's even an app for all of the attendees to connect, share schedules, and etc. It's an awesome tool to stay on task. I have joined Facebook groups also, already connecting and following tons of attendees that will be there. Just a few of the festivities that I am looking forward to are below! In between all of the above awesome parties, I am so excited to LEARN!!!! There are so many wonderful sessions set up to inspire, empower, and teach the thousands of women that flock to the conference annually. Some of the keynote speakers include include Academy Award Winner Gwyneth Paltrow, groundbreaking "Selma" director Ava DuVernay, activist, model and documentarian Christy Turlington Burns, journalist Soledad O’Brien, and Girls Scouts of America CEO Anna Maria Chávez. "My Little Brand"... By NO means,You are going straight o the top!! To the baddest, blessed "freshy" i know!!! Congratulations on this new Adventure. Blessings and Love. So proud of you for sticking it out! Keep moving forward! Girl, Nothing but GOD! Thank you!!! !